Born Apr 16 18501,5,6,7 [about 1849], Cherry Grove MM, Randolph County, Indiana1,5,6,7. Trueblood, Joseph, age 63, born in Indiana; parents born in North Carolina; farmer. Trueblood, Semira B., wife, age 60, born in Indiana; parents born in North Carolina; keeping house. Rafferty, Benjamin, living in family, age 20, born in Indiana; hired hand; attended school. Boling, Mary, living in family, age 17, born in Indiana; hired help. 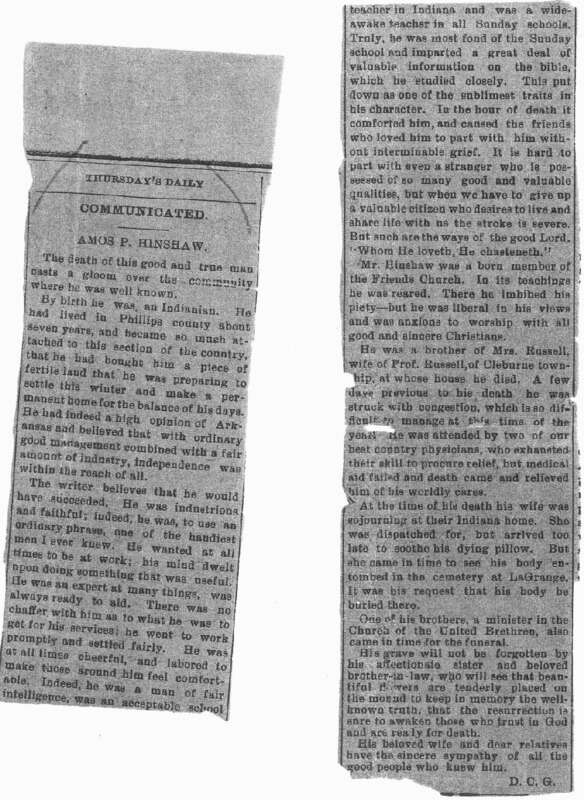 Hinshaw, Amos, son-in-law, age 31, born in Indiana; parents born in North Carolina; selling sowing machines. Hinshaw, Mary L., daughter, age 32, born in Indiana; parents born in Indiana; keeping house. Hinshaw, Joseph T., grandson, age 3, born in Indiana; parents born in Indiana. Hinshaw, Jane, granddaughter, age 1, born in Indiana; parents born in Indiana. Henshaw, Amos [unclear], servant, age 50, born April 1850 in Indiana; parents born in North Carolina; married; occupation: farm laborer. 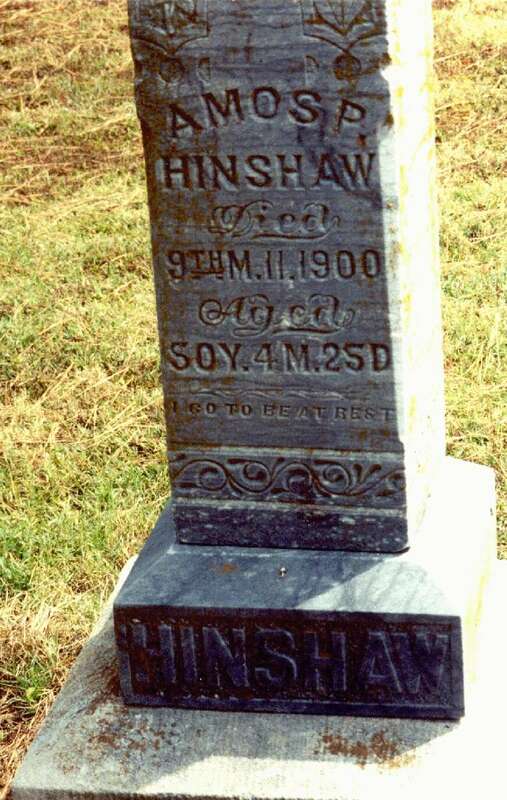 Hinshaw, Mary, head-of-household, age 51, born Aug 1848 in Indiana; parents born in Indiana; married 25 years; 2 children, 1 living; occupation: keeps roomers; owned home (free). Jeffery, Dessie, servant, age 26, born Aug 1873 in Indiana; parents born in Indiana; single; occupation: servant. At Mississinewa MM on 2-12-1920, Mary L. was granted a certificate to Long Beach MM, California4 (no mention of Amos - he may have died by then). Mary died Sep 28 19342,10, Washington County, Indiana2,10 [Long Beach, Los Angeles County, California13]; buried Blue River MM2,10. 1880 census, Washington Township, Washington County, Indiana; roll T9-321, ED 185, page 533B, line #37, dwelling #141, family #141. Work Projects Administration of Indiana, 1941 (Book I, Pg 75). Contribution from Jerry Richmond (). 1900 census, Marion, Center Township, Grant County, Indiana; roll T623-373, ED 29, page 7B, line #70, dwelling #153, family #163. 1900 census, Cleburne Township, Phillips County, Arkansas; roll T623-71, ED 74, page 7B, line #81, dwelling #123, family #124. Obituary of Amos Peele Hinshaw; contributed by Betty Louise Norton-Brock (). Gravestone of Amos Peele Hinshaw; photo courtesy of Betty Louise Norton-Brock ().